Sure-Loc Door Hardware - Tulip door knobs are great for home builders. - Shipped with rounded corner removable faceplate and adjustable backset drive in latch. 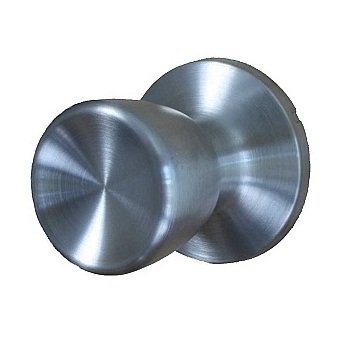 The Tulip Door knob from Sure-loc is an entry level knobset with all metal parts. 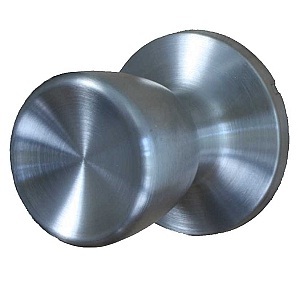 The Tulip doorknob is available in a Satin Stainless Finish. Its round door knob design is very stylish. If you would like a round doorknob with more of a ball shape you can check out the Sure-loc Tahoe knob. If you're looking for a doorknob that is simple in design and easy to install, the tulip door knob from Sure-loc is a great solution. - Adjustable Backset - 2 3/8" - 2 3/4"
- Industry standard installation fitting. - Replaces most existing locks. - Door Knob Warranty - 10 Yr. Mechanism, 5 Yr. finish. A knob for both sides of the door, latch mechanism, strike plates and mounting screws. Knobs for both sides of the door, latch mechanism, generic unlocking tool, strike plates and mounting screws. 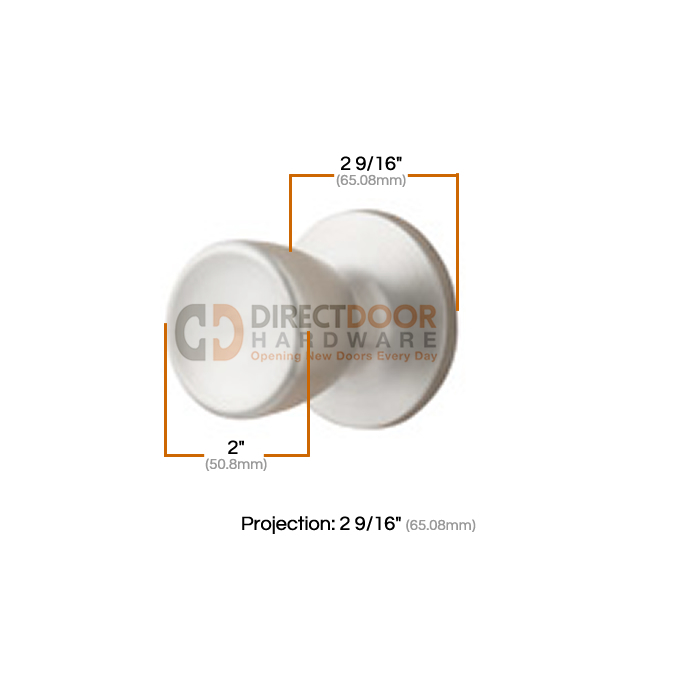 Knobs for both sides of the door, latch mechanism, keys, strike plates and mounting screws. If you have several keyed locks keyed alike, there may not be a key for every lock shipped. Sure-Loc door knobs are available in several functions. Please review the descriptions below so you can order the correct door knob for your application. Passage or Hall and Closet Doorknobs are used on doors that do not require a locking mechanism. Halls, closets, pantry or laundry doors will generally use a passage knobset. Passage knobs do not have a locking mechanism. Privacy or Bed and Bath Door Knobs are most often used on Bedrooms, Baths or Office doors where a lock for privacy while occupied is desired, but a keyed lock is not really necessary. Sure-Loc privacy knobs have a turn button on the end of the knob as shown to the left to activate the lock. On the outside, there is a pin hole for emergency unlocking. Some knobs will have a pin hole inside a circular piece, some just have a small pinhole. Keyed Entrance Door Knobs are generally used on exterior doors, but sometimes used on interior doors where security is a concern. 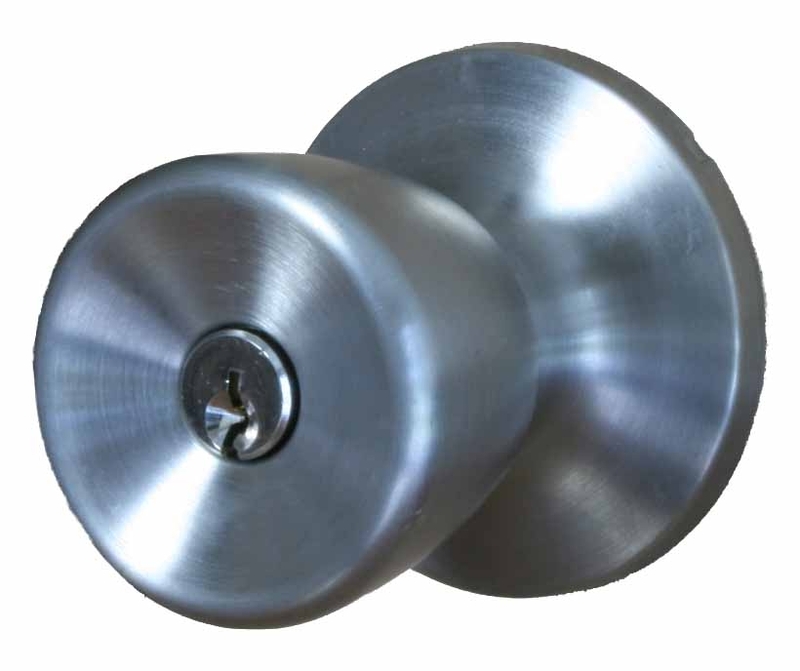 Sure-Loc keyed entrance knobs have a turn button lock on the inside, similar to a privacy lock. On the outside there is a keyed cylinder. If the knob is locked from the inside a key is required for entrance. If you are ordering several keyed locks of the same brand we can key them alike for you. Single Dummy Doorknobs are sold individually. Dummy knobs do not have a latch or mechanism of any kind. These knobs are surface mounted to a door that has not been bored (large hole cut out) for a doorknob. Dummy knobs are generally used on double doors that us a ball catch at the top to keep them closed so a latch is not required. They are also commonly found on the inactive side of a french door - a single dummy monted on either side of the inactive door. Sure-Loc Bathroom hardware has a 5 yr finish warranty. For more warranty information, please visit Sure-Loc's Warranty page. Sure-Loc door knobs or bathroom accessories can be returned within 60 days of purchase with a 15% restocking fee assessed. Please be sure to package your hardware well and in it's original packaging when making a return. Installed hardware cannot be returned. Please contact us for return instructions or see our returnspage for more information.